A surge of southern BBQ restaurants has taken the city by hickory smoke storm. Lex Taman, a self-professed “recovering baker”, and Eric Hadley, a chef of high and lowbrow cooking, opened Hadley’s in September, quietly. There was no media blitz; instead, locals generated their own buzz, intrigued by Hadley’s fantastically simple black-and-white illuminated sign. Curious neighbours must have thought, “Another BBQ restaurant just blocks from Toronto standby Phil’s Original BBQ? Let’s see if they can compete.” They can. If your olfactory senses hope to be hit by a wall of smoke upon entering Hadley’s, they will be disappointed. The air is startlingly refreshing, albeit, freezing. We seat ourselves in a burgundy vinyl booth and peruse the sturdy menu easily; the lighting at Hadley’s is operating-room bright. Pots and pans clutter the messy open kitchen. Yellow walls are bare but for one Toronto streetcar photo. We learn that first impressions should not always be trusted. Service is prompt and camaraderie begins with the drink orders. Choices vary from house-made lemonade and iced tea to local beer, martinis and cocktails. A veritable goblet of lemony iced tea ($3.75) arrives as we order from the menu of typical BBQ fare with a twist. Green Goddess salad ($6 – $9), a California classic of crunchy romaine, topped with creamy herb avocado dressing, is refreshing and welcome in Toronto anytime. Hush Puppies ($6), the often-forgettable deep fried Southern cornmeal fritters, are outstanding with pakora-like seasoning, a crunchy outer coating, and moist cornmeal centre. Ribs and pulled pork fill out the requisite BBQ niche on the menu while smoked chicken lasagna and smoked duck risotto pique curiosity. Sides are standard fare: coleslaw, macaroni and cheese, baked beans, potato salad, fries and salad. Succulent, lightly sauced and caramelized, pork back ribs ($17 – $24) are a hickory-smoked testament to how delicious a pig can be. Rotini-shaped, three-cheese macaroni and cheese is a playful variation on the norm and a well thought-out antidote to spicy ribs. Tangy, sweet, pulled pork ($9) comes on a fresh Portuguese bun topped with a variation of shredded coleslaw that lacks flavour but provides a satisfying crunch. 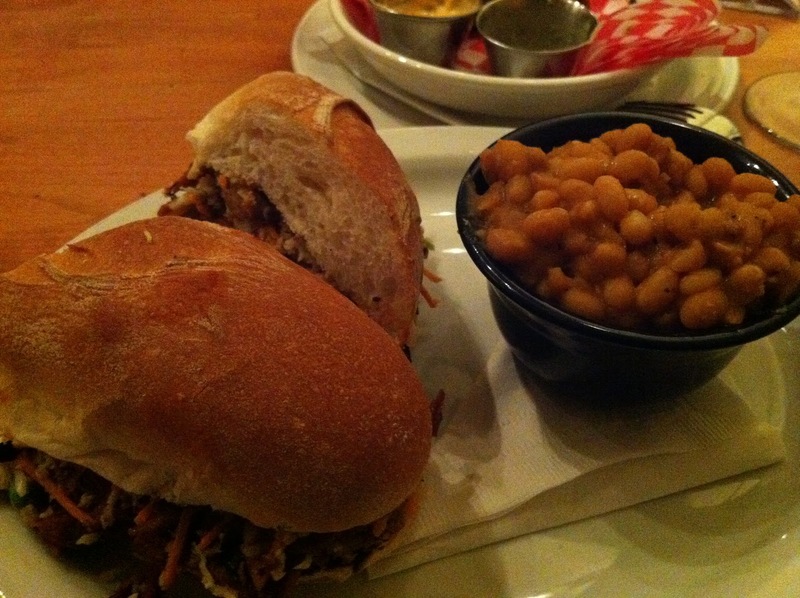 Slow-cooked cumin-spiced baked beans heat me up surprisingly well, perhaps this is their cure for a drafty restaurant? House-made desserts change daily. Standouts include a pucker-inducing lemon tart and a comfortingly gooey pumpkin bread pudding. Bustling with neighbourhood folks eating-in and picking up take-out, the only bland thing about the atmosphere at Hadley’s is the decor. 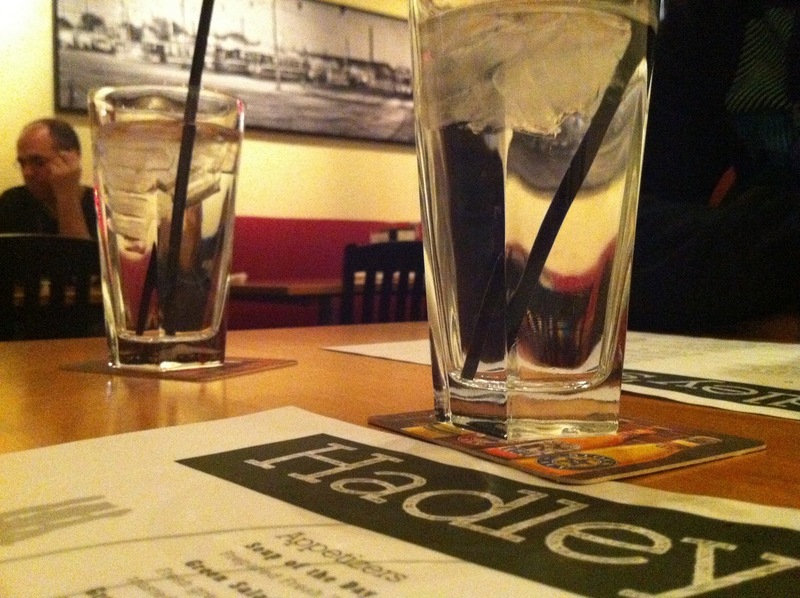 In a city of gorgeous restaurants with mediocre food, Hadley’s is a breath of (smoke-free) air.